The Standard Overlap Apex Modular Wooden Workshop gives a fantastic first impression. 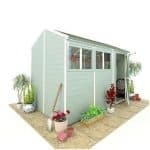 Standing at 15x10ft, this shed is multi-functional and could be used as a spacious workshop or as a storage solution for your outdoor and garden items. 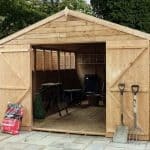 At an impressive 15′ x 10′ the Standard Overlap Apex Modular Wooden Workshop is large enough to cater for many requirements. As well as providing ample room for equipment, there more than enough space to work comfortably. 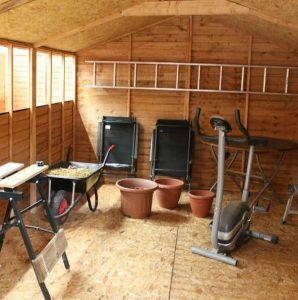 Alternatively, this workshop could be used as a large shed for storing big pieces of equipment, or it could even be used as space to store and use gym equipment. 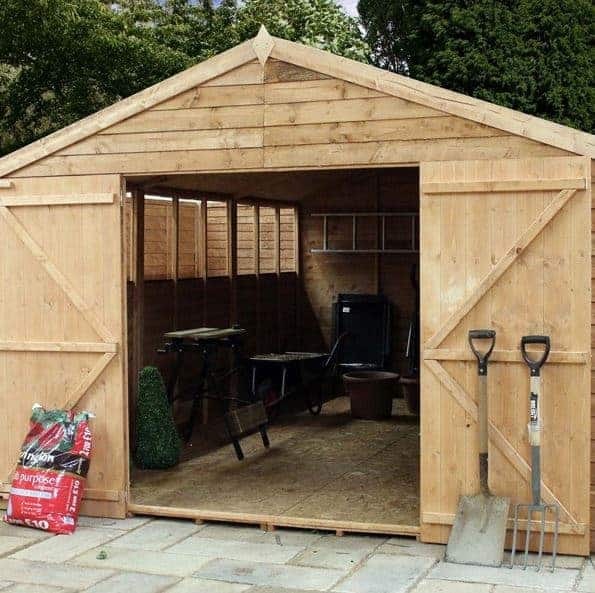 To add to the spacious feel of this wooden workshop, the wide apex roof provides plenty of headroom. Equally, the three, triple window panels that run along the length of one of the side ensure that the workshop benefits from a great deal of natural sunlight. The wide double doors allow a complete overview of the items inside and easy accessibility for even the largest items being stored. 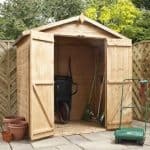 With a 10-year anti-rot guarantee, you can be assured that this is a high quality shed that will last for many years to come. 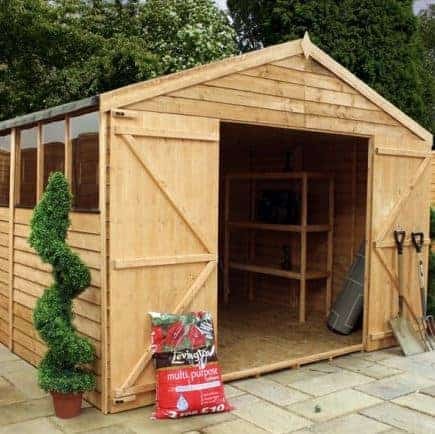 On searching for a sizeable workshop such as the Standard Overlap Apex Modular Wooden Workshop, we understand that it is important to choose the right shed because of the aesthetic impact it will have on your garden and also the higher price that this type of building commands. In this section we discuss the features that this workshop has to offer in more detail. Exterior: The workshop is constructed from Baltic sourced pine cladding that overlaps to provide extra strength to the structure. The exterior is aesthetically pleasing with a natural wooden appearance that will blend into your garden. Interior: The 15x10ft workshop interior is an impressive space in which you can undertake all of those projects on your to-do list. It provides a blank canvas for you to organise the space as you wish, adding shelving and/or freestanding units for further storage solutions. Windows: There are a total of nine (yes, nine!) windows along one side of the workshop, allowing a huge amount of light to enter the workspace. The height of the windows is great for security and allows for the workshop interior to remain fairly private. Doors: The double doors boast an impressive 2’5” width that allows easy accessibility for anything being transported in and out of the workshop. 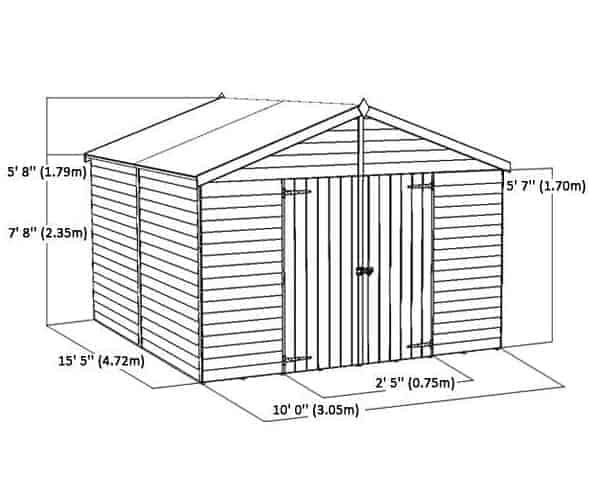 The size of the doors and workshop combined means that this particular model is the ideal storage solution for larger items and equipment. Security: The workshop’s double doors come complete with a pad-bolt, which is essentially, a slide bolt fitting that a padlock can be attached to to keep your items safe and secure. A padlock can be purchased separately at a modest price. 15 x 10 Standard Overlap Apex Modular Wooden Workshop: How easy to build? Due to the large size of this workshop it will be necessary for two people minimum to work on assembly of the workshop together. The panels may be larger than an average shed and it will be safer all round to work on it this way. The workshop will come flat-packed with all the panels, glazing, roof material, fixtures and fittings required for a straight-forward assembly. Complete instructions are provided with clear written instructions and easy-to-follow diagrams to keep you on the right track. We expect that this workshop will take up to a day to put together with a general knowledge of DIY. 15 x 10 Standard Overlap Apex Modular Wooden Workshop: What is the overall quality like? 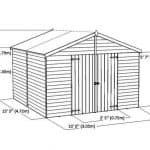 The entire exterior of the Standard Overlap Apex Modular Wooden Workshop is truly built to last. From the 8mm overlap cladding to the solid sheet flooring and roof, this workshop has been thoughtfully designed and constructed in a way that will make it last for many years to come. With a 10-year anti-rot guarantee, you can feel safe in the knowledge that the timber used in construction is of the highest quality and will protect your items from the elements as well as damp, rot and mould issues. The workshop is low maintenance and should only require a window cleaning session every so often to keep its attractive appearance as well as leaving those windows sparkling. 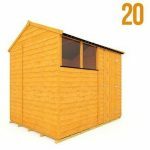 The 15 x 10 Standard Overlap Apex Modular Wooden Workshop is an impressive outdoor building at an amazing price. 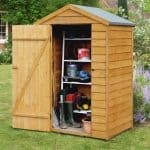 It would be a fantastic workshop space and equally great storage solution for all of your outdoor and garden equipment. 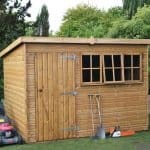 The large size makes it particular suitable for bigger items such as trampolines and the like that smaller sheds would not be able to accommodate. 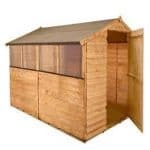 A superb product for those looking for a flexible use outdoor building.